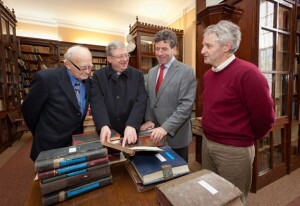 The new archival shelving was installed in early March in two of the six rooms which Mgr Kieron Kennedy and the Trustees of St Kieran’s College have placed at the disposal of Kilkenny Archives. They believe that Kilkenny Archives will have a pivotal educational role on the College Campus (and for Kilkenny as a whole) in the years ahead, alongsinde the Outreach of the National University of Maynooth and the Waterford Institute of Technology. The Maynooth Outreach at St Kieran’s College will this year accept First Arts students. Mr Herlihy was delighted to see Glanbia’s own archives, representing a number of the old co-operative creameries, which are now part of this ever explanding dynamic Irish company. Minute Books and other records are in situ. There also also records from non-dairy companies and these records have been fully accessioned and are currently available for consultation. Barrowvale Co-Operative Dairy Society Ltd.
Graiguecullen Corn & Coal Co. Ltd.
Kells Co-Operative Agricultural & Dairy Society Ltd.
Knockavendagh & Moylgass (Killenaule) Co-Operative Creamery Society Ltd.
Muckalee Co-Operative Dairy Society Ltd. The Bacon Company of Ireland. Awaiting to be catalogued are the records from Inch Creamery, Co Wexford, which only arrived at Kilkenny Archives recently. These include Minute Books, milk records and a number of framed illustrations including a portrait of Francois Mitterand, President of France, partaking of a Yoplait Yogurt. Inch was an early creamery. Around the beginning of the 1890s the first of the Irish creameries were established. By 1893 there were at least thirty in the country. In 1895 the farmers around Inch came together and set up their creamery with a foundation date of 29 March 1895. The clergy often paid a key role and Inch is no exception with the then Archbishop of Dublin advancing a loan of £100.00 provided a creamery along the lines of those advocated by Sir Horace Plunkett, who is perceived as the founder of the Irish creamery movement. To put the archbishop’s loan into perspective the site of new creamery was purchased for £10.00 plus ten £1 shares in Inch Creamery. By 1900 there were over 800 co-operatives in the country of which 350 were creameries. One of the oldest illustrative items in the Glanbia Collection is a view of the old Barrowvale Creamery at Goresbridge which buildings have been subsumed into later developments on the site which is just off the Main Street, at Goresbridge, very near the bridge from which ‘Goresbridge’ derives its name: the really old name for the area as opposed to the site at the bridge was Grange Silvae. The surname Gore commemorates a family of that name which built the nearby Barrowmount House in the very early years of the eighteenth century, which for many years in the last century was owned by Jack Donohoe, formerly of Lower Grange and Ballellen, whose family would have supplied milk to Barrowvale. Jack Donohoe and his wife Lulu are best remembered for their ownership in the 1960s of the famous mare, Height O’ Fashion. Kilkenny Archives is also home to the following collections: The Prior-Wandesford Family Papers; The Barton of Ballyline (Callan) Papers; The Paper of the Estate Office of Kilkenny (A.G. Davis); Kilkenny Castle Papers; Gowran Castle Papers; Kavanagh Estate Papers, Ballyragget; The Maidenhall-Lavistown Papers; The Briggs-Swifte Papers; The Wheeler-Cuffe Papers of Lyrath and The Papers of the Praesidium of Our Lady Queen of Charity (Legion of Mary). Arising from this extended facility Kilkenny Archives are in a position to accept further donations. Last year Glanbia became the first commercial company in Kilkenny to recognise the worth of Kilkenny Archives Ltd., and see a community value in what it does. Last last year it handed into the safekeeping of Kilkenny Archives all its old Creamery Records and a very generous dontation which paid for the accessioning and boxing of these valuable Kilkenny Creamery records, most of which were old Minute Books. The archives of many of the long-established creameries that subsequently became part of Waterford Foods and Avonmore Foods, which combined in 1997 to create Glanbia, are now housed in the care of the St. Kieran’s College-based Kilkenny Archives and are accessible for public viewing. In the course of researching a history of Glanbia to commemorate the 10th anniverary of the merger – and the subsequent publication of Glanbia – The Story So Far, many records were located throughout the South East and are now part of the Glanbia Archive which is on a long-term loan to Kilkenny Archives Ltd. The Glanbia Collection has records from Avonmore, Ballingarry, Barrowvale, Ballyale, Ballypatrick, Ballyragget, Castlehale, Castlecomer, Donaghmore, Dungarvan (Co. Waterford), Freshford, Glenmore, Graiguecullen (Co. Carlow), IDA Co-Operative, Kells, Kilkenny (city), Leinster Milk Products, Letterkenny Milk Products, Letterkenny Timber Co., Loughcullen, Miloko, Muckalee, Mullinavat, Piltown, Slieverue, The Bacon Co. of Ireland and Windgap. “Glanbia has a long and proud history embedded in the Co-operative movement of late 19th and 20th century Ireland”, said Glanbia chairman Liam Herlihy. “We have evolved from more than 50 individual companies and co-ops in a vibrant international cheese and nutritional solutions company which is today exporting to more than 100 countries worldwide. This growth and succss is a tribute to our forefathers and we value the lessons learned from these men and women who worked tirelessly to create the co-operatives, which are the bedrock of Glanbia”. Among the records lodged include the minute books and papers of Kilmanagh Co-operative Creamery, which is one of the oldest – if not the oldest – creamery in Kilkenny.